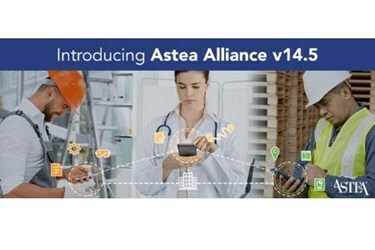 Horsham, PA /PRNewswire/ -- Astea International Inc., a leading global provider of service management and mobility solutions, introduces the release of Astea Alliance™ 14.5. This release represents a major step in unifying and connecting all service stakeholders—both within and outside of an organization—into one cohesive service ecosystem focused on delivering superior service outcomes for a company and its customers. Designed to share information and data effortlessly through more physical and digital mediums that ever before possible, Astea Alliance 14.5 provides extensive connectivity designed to strengthen the relationship between a service provider and its customer: portals that provide a 360 degree view of the relationship; the ability to leverage contingent worker job markets; seamless scheduling of employee, third party and contingent workers within one environment; and a best-in-class mobile experience for technicians, subcontractors and customers. "We believe the boundary that separates a customer from their service provider is an antiquated concept," says David F. Giannetto, chief operating officer of Astea International. "IoT began to break down this barrier, but it is now clear that simplifying the complexity of connectivity, creating a proactive service model that leverages any type of worker or asset, and seeing the larger picture of how service delivers value, all require that every single service stakeholder be seamlessly connected. Achieving this vision requires a service platform that connects not only devices, but also people, processes, technology and information." The Astea Alliance 14.5 release responds to a wide range of market demands focused on achieving tangible positive outcomes for service operations. These outcomes include: the more efficient utilization of workforces and smarter allocation of native, third party and contingent workers; the alignment of technology with the growing desire for a 'mobile-first' strategy; and user-friendly portals and applications that visualize critical data and facilitate effective interactions between a service company and its stakeholders. When properly combined, these outcomes enable service-driven organizations to improve their responsiveness to increasingly-demanding customers, which can result in significant competitive advantages. The Alliance Mobile Customer Portal breaks down the traditional barriers between service providers and customers. Organizations can now provide customers with a convenient mobile portal where they can interact with their service partner in real-time using intuitive technology that is accessible anytime, anywhere, on nearly any mobile device. In the Alliance Mobile Customer Portal, clients can self-service a variety of tasks: create and edit service orders; view contract quotations; view invoices and activities; and visualize the service technician traveling "Uber-style". Customers can also search the Knowledge Base for answers to service issues, which may prevent the dispatching of a technician, further reducing service costs and freeing up limited resources. Alliance arms service companies with valuable business intelligence on customers' service experience, thereby empowering them to transition from vendors to trusted partners and advisors. The Alliance Mobile Customer Portal also enables service organizations to upsell, resell and cross-sell to customers, thereby adding new revenue streams at no additional cost. Included in this release is the newest version of Astea's mobile application, Alliance Mobile Edge™, which utilizes the latest in mobile development technology and design principles. While Alliance Mobile Edge delivers all the features and functionality that native field technicians require, the new Vendor Mobile application offers a streamlined version that is designed for third party workers. Alliance Vendor Mobile answers the market's increasing need to provide seamless connectivity with contingent workers. It also ensures that a contingent workforce has access to the same tools as native workers; the end result of which is greater efficiency and productivity across an entire service organization and a seamless, cohesive customer experience. The use of contingent workers is a major trend in the field service industry because it offers numerous benefits including: flexibility and agility; overcoming geographic limitations; ability to scale with business expansion in a cost-effective manner; and the ability to meet growing customer demands. Contingent workers can only deliver these benefits if organizations can use them in a cohesive, seamless manner that aligns with their own service standards. The new version of Alliance enables companies to leverage any type of worker in the most effective way, and then monitor their performance as if they were their own employee. Service companies can consider the best and most cost-effective mix of native, third party and contingent workers when scheduling and dispatching right within the Alliance platform. In addition, contingent workers stay connected to the back office in real-time, giving service organizations visibility into all field workers and enabling them to schedule, monitor performance and bill more efficiently. Since Alliance extends similar functionality to third party workers as it does to native workers, customers will experience the same level of service. This seamless connectivity across all workforces can translate into a seamless customer experience. The latest version of Alliance delivers significant enhancements to its Dynamic Scheduling Engine (DSE) and Dispatching Console so that organizations can optimize schedules across all its workers, control and reduce costs and meet customers' increasing demands for tighter appointment windows. These enhancements allow it to mirror the way your company thinks about the services it delivers and the unique way your organization balances cost, service-level, unproductive time, predictive versus preventative maintenance and a wide range of other variables. These capabilities allow service organizations to not just optimize schedules and costs, but also differentiate their service experience from every other competitor in their market. To request a live demonstration of Astea Alliance, click here. © 2017 Astea International Inc. Astea, Astea Mobile Edge and Astea Alliance are trademarks of Astea International Inc. "Uber" is a trademark of Uber Technologies, Inc. All other company and product names contained herein are trademarks of the respective holders.